The Canon EOS Rebel SL2 (EOS 200D outside the US) is one of Canon’s most compact DSLRs, designed to appeal to those who are looking for a small and unintimidating camera, but want image quality that surpasses that from a compact model. However, while the original Rebel SL1 / 100D arrived some four years ago and was designed to tempt users away from the mirrorless camera onslaught, Canon’s own mirrorless range of cameras has expanded since then, so where does the EOS Rebel SL2 / EOS 200D now fit in? With the 18MP sensor in the outgoing EOS Rebel SL1 / EOS 100D starting to look very dated against much newer competition, it’s no surprise to see the EOS Rebel SL2 / EOS 200D get a bump in resolution to 24.2MP. It’s the same sensor we’ve seen recently in both the EOS Rebel T7i / EOS 800D and EOS 77D. The camera also gets Canon’s latest DIGIC 7 image processor. The DIGIC 7 is said to be able to handle 14 times more information than the DIGIC 6, so it should be an even bigger step up from the DIGIC 5 chip in the Rebel SL1 / 100D. This should deliver a big jump in AF performance, which we’ll come to shortly, but the DIGIC 7 also helps to facilitate the Rebel SL2 / 200D’s ISO range of ISO100-25,600. That’s an extra stop more than the Rebel SL1 / 100D’s ISO ceiling of 12,800, while there’s also a Hi setting equivalent to ISO51,200, although you’ll have to select this in the custom menu. Instead of the display sitting flush with the body, as we saw with the Rebel SL1 / 100D, the EOS Rebel SL2 / EOS 200D now gets a 3.0-inch, vari-angle touchscreen display with a resolution of 1,040,000 dots. The coverage of the optical viewfinder is only 95%, which is typical for DSLRs at this price, so you may find that unwanted elements creep into the edges of the frame when your review images. If framing is super-critical, you’ll want to use the rear display. The Rebel SL2 / 200D also gets Canon’s new graphical user interface, which is designed to help new users get to grips with their camera and its various shooting modes; this can be turned off in the menu to be replaced by Canon’s more traditional interface. As we’ve seen with Canon’s other recent DSLR announcements (with the exception of the EOS 5D Mark IV), the EOS Rebel SL2 / EOS 200D doesn’t have 4K video capture, with Canon settling for Full HD, although footage can be captured at up to 60p. Canon is plugging the EOS Rebel SL2 / EOS 200D as “the perfect replacement for the avid smartphone photographer looking to step up to their first camera”. And, to tempt those users in, it’s included a new selfie mode, together with skin smoothing and background blurring controls. As is standard now on most cameras, there’s built-in Wi-Fi, NFC and Bluetooth connectivity, so those used to quickly sharing their images on social media should be able to carry on where they left off. You’ll just need to download the free app to take advantage of this. Thanks to the inclusion of the vari-angle display, the EOS Rebel SL2 / EOS 200D can’t take the crown away from the Rebel SL1 / 100D as the world’s smallest DSLR, although it is the smallest DSLR with a vari-angle screen. And it’s still incredibly compact for a DSLR, measuring 122.4 (W) x 92.6 (H) x 69.8mm (D) and weighing just 450g with a battery and card installed. The Rebel SL2 / 200D is available in three finishes. There’s a white version and a silver/tan option, although most people will likely prefer the more sober black version, the matte finish on which looks particularly fetching against the silver-toned controls on the top plate. However, thanks to a combination of polycarbonate resin and carbon-and-glass-fibre, the majority of the camera’s surface finish suffers from the same plasticky feel we disliked on both the Rebel T7i / 800D and EOS 77D; it just doesn’t feel that nice to the touch. The hand grip was pretty much non-existent on the original SL1 / 100D in an effort to cut down its size, so it’s great to see that the grip on the EOS Rebel SL2 / EOS 200D is now pleasingly deep, and it should offer enough support for most people. The material for the hand grip has changed though, with Canon reverting to the traditional-looking leatherette finish it uses for a lot of its DSLRs, rather than the more modern-looking dimpled texture employed by the Rebel SL1 / 100D. Canon has overhauled the top plate for the Rebel SL2 / 200D, with the mode dial now recessed into the body, and has gone with a new power control that gives immediate access to movie recording. There are also dedicated buttons for connectivity and display, in addition to the ISO button. The ISO/Disp buttons are somewhat spongy, however, while the shutter release button has a certain hollowness to it. Round the back the controls are pretty much identical to those on the Rebel SL1 / 100D. The rear of the camera is relatively uncluttered, with the biggest change being the vari-angle screen, with a little indent next to the viewfinder enabling you to pull the display out from the body. 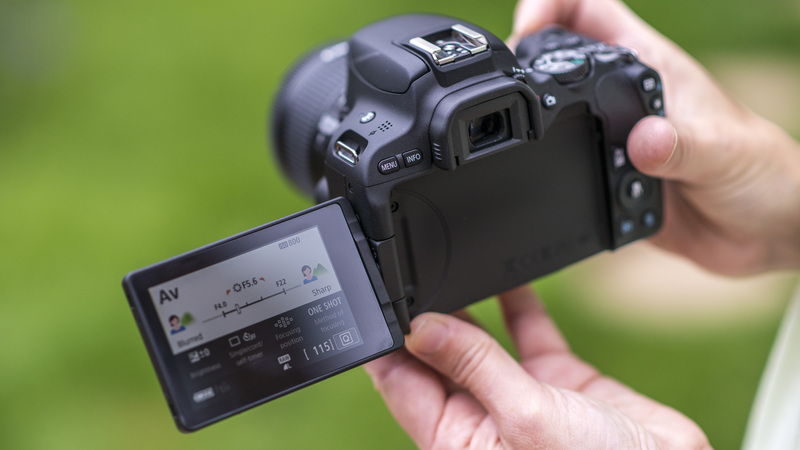 As we’ve seen on other Canon cameras, the touchscreen interface is perhaps the best around, offering a polished user experience for both shooting and reviewing images. While there have been numerous improvements elsewhere, the 9-point AF system from the Rebel SL1 / 100D gets another run out in the EOS Rebel SL2 / EOS 200D. Notwithstanding the fact that this camera is aimed at new users, this omission is a bit of a disappointment, especially as both the Rebel T7i / 800D and 77D use a new 45-point AF system. The points are arranged in a modest diamond formation, but while they’re reasonably well spread out across the frame there’s just a single cross-type AF point. For comparison, all the Rebel T7i / 800D’s 45 AF points are cross-type. Why’s that such a big deal? Cross-type sensors are sensitive in both the horizontal and vertical planes, so when the camera’s focusing it’s more likely to lock onto its target than a sensor that’s sensitive in just one plane, which can mean you have to rotate the camera to achieve focus. For general photography the AF system performs fine; in our tests it proved its worth in both good light and even in darker indoor conditions, and focused on low-contrast subjects better than expected, but should you want to press it into more challenging situations, such as tracking moving subjects, you’ll be left wanting. There is one improvement in this area, with the arrival of Canon’s Dual Pixel CMOS AF system, which allows the camera to use phase-detect AF for faster focusing speeds in live view mode and during movie recording; many DSLRs at this price point rely on contrast-detect AF for live view shooting, which, while very accurate, can be slow. Focusing is smooth and fast, and easily a match for mirrorless rivals. With the arrival of the DIGIC 7 engine, Canon has stretched the burst shooting speed of the EOS Rebel SL2 / EOS 200D to 5fps, from 4fps on the Rebel SL1 / 100D. This burst rate is what we’d expect from entry-level DSLR at this price point, but those wanting to regularly shoot a fast sequence of shots, and who are on a budget, might want to look at some mirrorless rivals. Many of the features we’ve seen on much pricier EOS models have also made the cut here, such as the various lens aberration corrections and the time-lapse movie mode. Impressively, you even get in-camera raw processing, which is great for those who want to share their images immediately without compromising on quality. 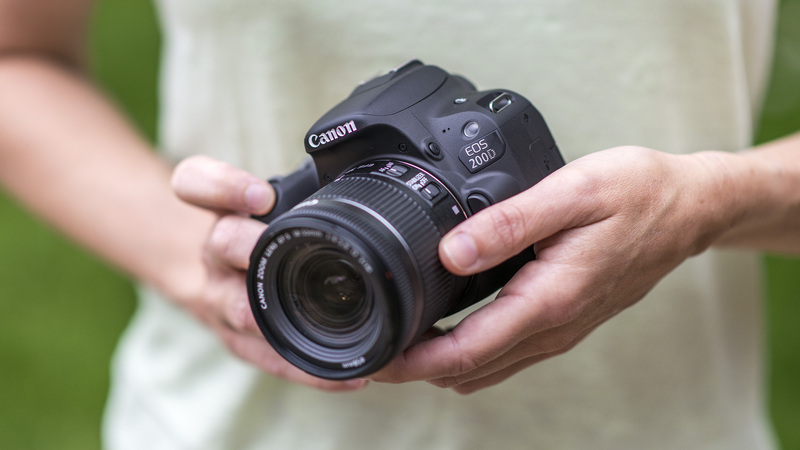 If that all sounds quite advanced, don’t be put off, as the EOS Rebel SL2 / EOS 200D is perfect for new users thanks to the clean graphical user interface. This is an area in which Nikon has been really strong, with its Guide Mode on the likes of the D3300, so it’s good to see Canon follow suit. We first saw this interface on the T7i / 800D, and those taking their first steps in creative photography should find it really useful. Key settings are explained on screen, while the effects of changing a setting are illustrated in the various shooting modes. For example, in Aperture Priority mode the display will show what settings are needed for a blurred or sharp background, with annotations that change as you increase or decrease the aperture. If you’re a more experienced user looking to use the Rebel SL2 / 200D as a second body, you can disable this feature in the menu if you wish, and stick with Canon’s more traditional menu system. The Rebel SL2 / 200D’s metering is handled by a 63-zone dual-layer metering sensor, with Evaluative, Partial, Centre-weighted and Spot metering options. We found the Evaluative mode did a sound job; it did have a slight tendency to underexpose shots, but that’s no bad thing in bright conditions when you want to preserve highlights. The white balance system performs well, and it’s nice to see the inclusion of an optional Ambience Priority white balance mode, which delivers a slightly warmer look to help retain the atmosphere of shots that can sometimes be lost. For occasions when you want a more neutral result, the White Priority white balance mode delivers clean, color-cast free results. Battery life is pretty good – at 650 shots per charge it’s actually better than on the Rebel T7i / 800D, and quite a bit better than comparable mirrorless rivals. If you’re going to be using Live View for shooting pretty much full-time, though, be warned, as the battery life plummets to 260 shots. The EOS Rebel SL2 / EOS 200D’s 24MP APS-C CMOS sensor does a solid job, rendering very good levels of detail at sensitivities up to ISO1600. You’ll easily be able to produce detailed prints at A3 size at 300dpi, while files should be able to be enlarged even further if needed. 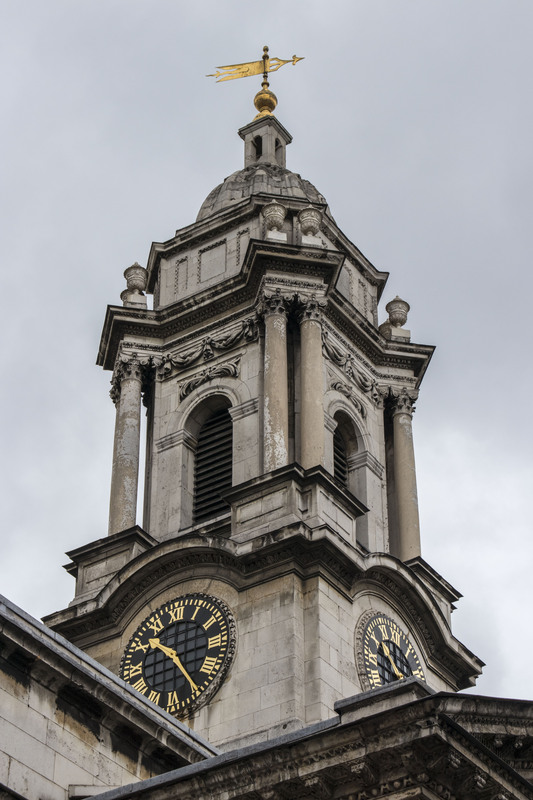 At low sensitivities, the Rebel SL2 / 200D handles image noise very well. Images appear noise-free all the way up to ISO3200, with colors nicely saturated. Even at ISO6400, while noise is evident, it’s well controlled, and there was hardly any chroma (color) noise present in our shots. If you’re prepared to sacrifice a bit of detail, then ISO12,800 is still very useable, despite both luminance (grain-like) and chroma noise being much more noticeable. Saturation of colors also suffers, but considering the sensitivity setting it’s still very good. We’d avoid using settings beyond that unless it’s really necessary. 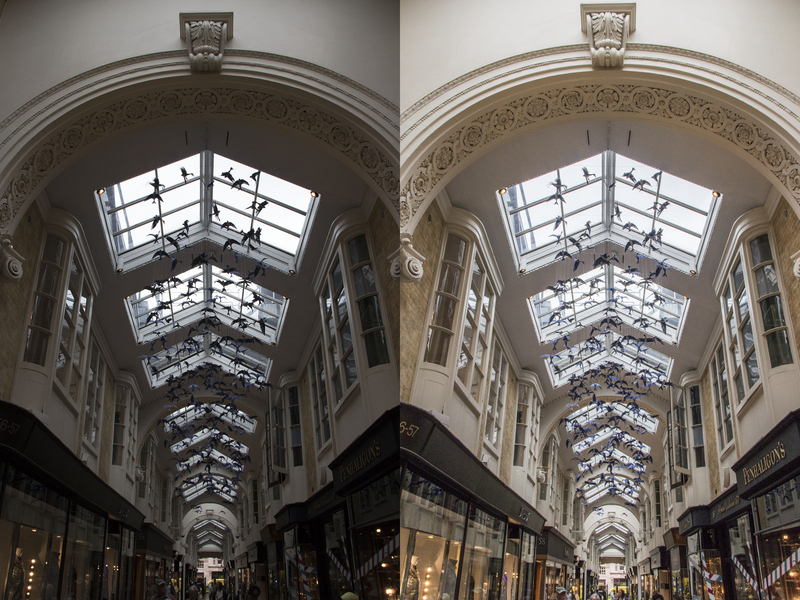 Dynamic range is also good, but it’s still not quite a match for rivals like Nikon’s D3400 – there’s just not the same latitude in raw files to recover highlight and shadow detail. The compact proportions of the original EOS Rebel SL1 / EOS 100D meant it was a truly novel camera amongst its peers, but the slightly bulkier proportions of the EOS Rebel SL2 / EOS 200D make it feel more like a slightly pared-down Rebel T7i / 800D than anything unique. So what else does the Rebel SL2 / 200D have going for it if it can’t brag about its svelte dimensions anymore? Quite a bit, actually. The Dual Pixel CMOS AF in Live View is excellent, while the refined touchscreen control and vari-angle display all add to its ease of use. And that’s not forgetting the guided user interface, which offers a more welcoming experience for new users. We’d have liked to have seen more AF points spread across the viewfinder, but the AF performance is very good for general photography. Do we have any other concerns? The plasticky finish and the absence of 4K video capture disappoint, but perhaps the main hurdle the EOS Rebel SL2 / EOS 200D has to overcome is its price relative to the competition. Even if we just look at Nikon’s DSLR offerings at around the same price or less, you’ve got three capable options: the D3400, D5300 and D5600. And that’s before you consider mirrorless alternatives.